Being a member of the Glowbal group, their decoration/interior design needs to live up to an expectation and this one does for sure. With a beautiful lit bar in the center of the restaurant and geometry globe lamps hanging from the ceiling and with seats surrounding the center made the restaurant sparkles. I have been to Black & Blue before for a graduation dinner party and we were seated at the roof during a fall evening. It was pretty up there and could get romantic with dark clear skies. This is indeed a very beautiful restaurant, inside and out. 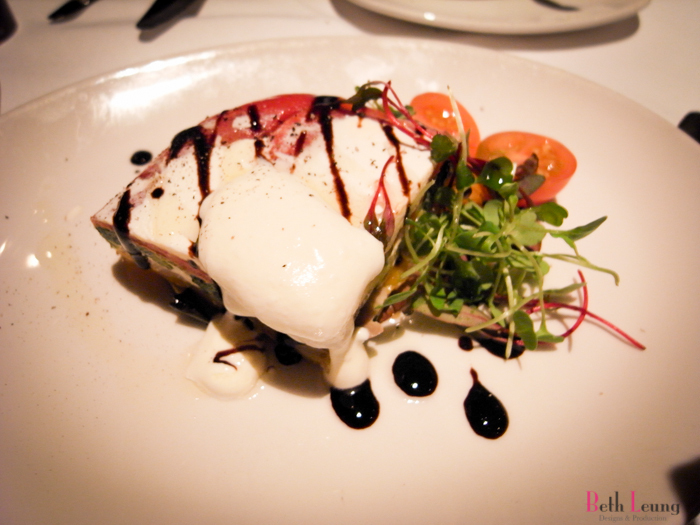 Josper Grilled Vegetable Napoleon – goat cheese, bell peppers, zucchini, mushrooms. The name comes from the stacking of the vegetables similar to lasagna, it was so visually pleasing to see with all these beautiful colours. I personally likes goat cheese but I still find the goat cheese is a little over powering the vegetables. I had to push off some to the side to get a real taste of the vegetables, but this is a good vegetables dish. 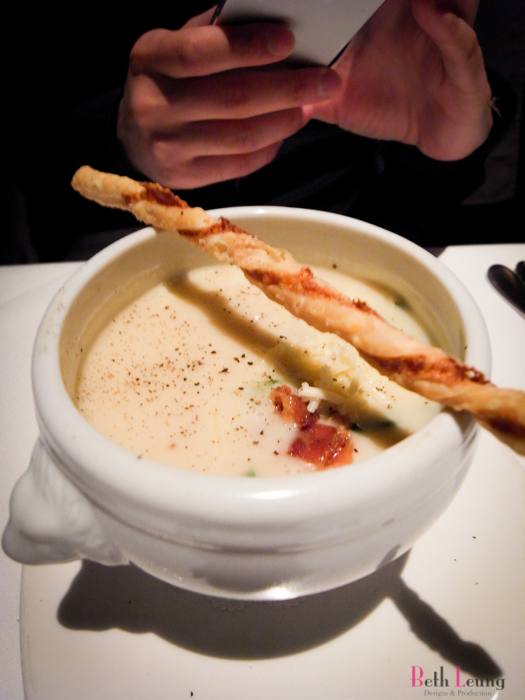 Loaded Baked Potato Soup – double smoked bacon, chive crema, cheddar. I have to say there is really nothing special about this soup. It’s a potato soup alright, just a potato soup really. Bacon was a little salty but acceptable. 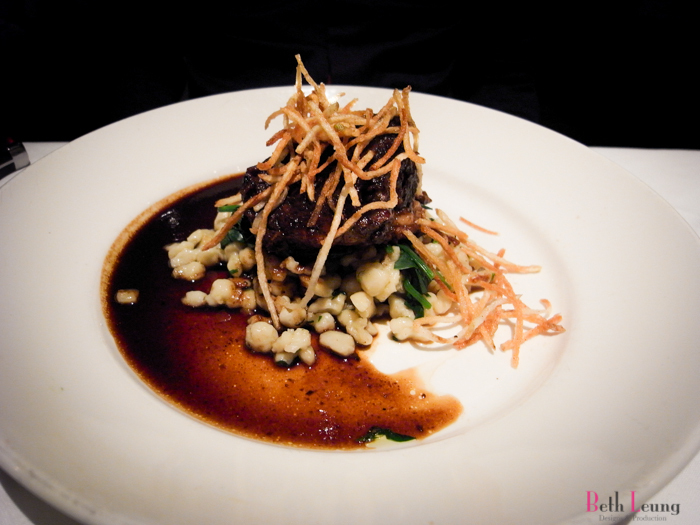 Slow Cooked Guinness Braised Short Rib – applewood smoked cheddar spätzle, winter greens. The ribs is quite soft, the meat comes off verily easily when you lift it lightly with your fork. However I wish it was more juicy, it is a little on the dry side. But flavour is great. 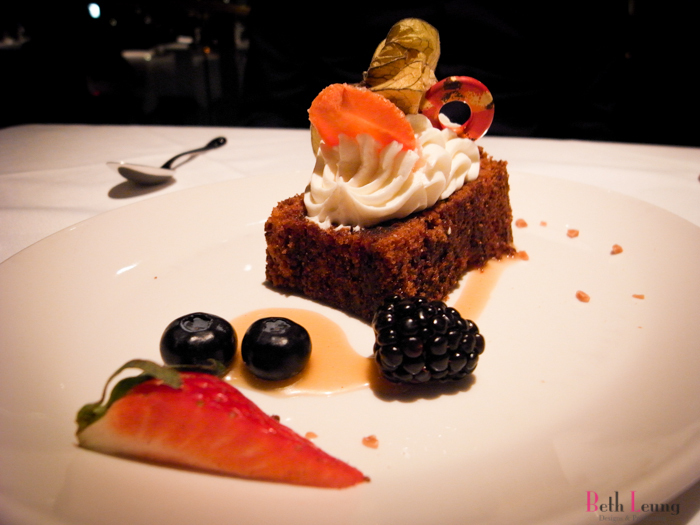 B&B Carrot Cake – coconut & ginger macaroon, cream cheese candied carrot. I am not into carrot cakes, I never order carrot cake to eat anywhere. So I was a little sad to see their only dessert option is carrot cake. I asked the to server to see if I can switch to another dessert (pay the difference) but wasn’t able to do it. For two of us I told him we only need one carrot cake, because I probably won’t eat the second one. But he was kind enough to take the carrot cake price off the bill for us. Anyways, since I am not into carrot cake so I don’t know how fair this part will be. There is nothing special about this carrot cake, it’s carrot… and cake. But the frosting on the top is a little sweet. Overall I had a good dining experience here, but both times I was here the service seems to not pop out at me. Or I was expecting too much? 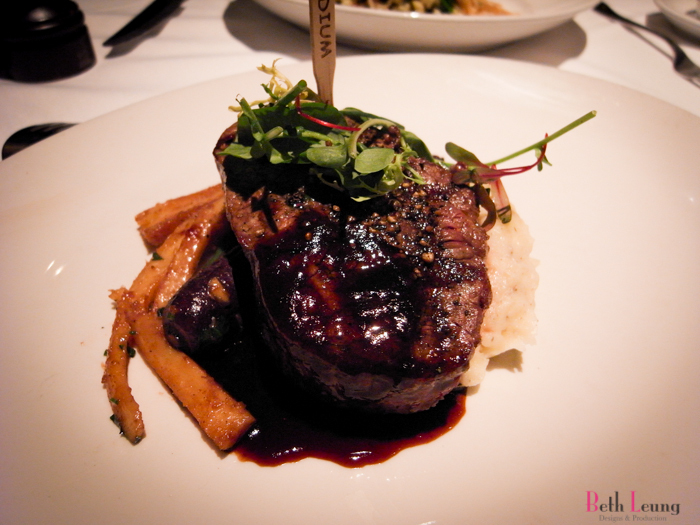 It is a very upscale downtown steakhouse, I would expect close to supreme customer service. But both times I didn’t get any, was good service just not good enough. For their normal price, I might consider going somewhere else. Because even if they have good food, I just cannot justify the price. It is not THAT good for that kind of pricing. I will return if anyone books a dinner here.